Manufacturing and sales of lightweight telescopic cranes for vehicle superstructures: Haulerman is a part of a family run company, established in Finland in 1946. Our main office is located in Turku - the heart of the Finish marine industry. We combine solid design expertise with strong equipment and functionality of high efficiency which derives from our ties to the marine business, now converted to land use vehicle based loading equipment. 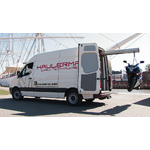 Haulerman offers an innovative and versatile way of loading and turns your van into a mobile crane of high quality. The patented telescopic built-in crane weighs 225kg, has a lifting capacity of 250kg and reaches up to two meters in length. It is easily operated with a remote control and powered with a separated 12V system. It turns your van into a independent loading unit and it can also be used for supporting tasks such as pulling and lifting heavy objects. Haulerman is safe to work with, slim in design - a strong and efficient solution for various needs. Vehicle superstructure manufacturers and end users. To extend our presence on the German market we are also looking for partners for our installation and service network.